It's a grim reality: 1 in 4 U.S. women will experience domestic violence in her lifetime and children and men are also often victims as well. To spread the word about this important issue affecting all of us because even if you are not a victim yourself, you likely know someone who is (even if you are unaware of the violence they're enduring) MBE is partnering with HopeLine® from Verizon. Also in support of Domestic Awareness Month I'm hosting this great giveaway below of the same special edition purple LG Tone Pro Wireless Stereo Headset you can buy at Verizon stores and online helping to raise badly needed funds, up to $100,000 which Verizon will donate to National Domestic Violence Hotline. 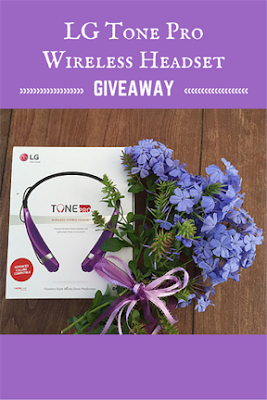 MommyBlogExpert's LG Tone Pro Wireless Stereo Headset Giveaway ends November 6, 2015 at 12 am PT and is open to legal residents of the U.S. only. Verizon will award ONE (1) LG Tone Pro Wireless Stereo Headset to winner. Winner of this MBE contest will be selected at random from all entries and will be notified via email and must respond within 24 hours to claim their prize. Since 2001 Verizon has been commited to domestic violence awareness and prevention. The public can take action to support this cause by donating old and used smartphone at Verizon stores nationwide or by mailing them in with a free postage-paid envelope that you can request. So far the brand has collected 11.4 million phones and donated 190,000 phones. For more information visit the official HopeLine website. For find the retailer nearest you, check the Verizon store locator. You can also stay up to date on everything Verizon is doing by following them on Twitter and Facebook. FTC Disclosure: This is a sponsored post for SheSpeaks/HopeLine® from Verizon and I received compensation for this giveaway and the associated review. However opinions in this post are my own. See complete FTC Disclosure information that appears at the bottom of MommyBlogExpert's main page and at the bottom of every individual post on this blog, including this one. That is an awesome headset! It would be perfect for me at the gym! I like that the hopeline is purple and compatible with apple. If I won, it would be a gift for one of my kids. I love the cause it supports, the color, and the battery time! I'd love to have one of these! The 16-hour talk time is impressive! I like the battery time and the call and pause/play buttons and I'd like to win because I really want a nice headset. Thanks so much for the chance. It is an issue that affects everyone and I love that LG is helping raise awareness. Thanks for the great giveaway too! This headset would be a perfect gift for myself. I always put everyone ahead of me, but this would great to personally use. I love that it's wireless and rechargeable. I love that is has music listening time up to 10.5 hours! I would love to win this for my son, who would be thrilled! It is great to know about the HopeLine. I know some people that have been hit and it is hard making them see how unacceptable that is. Oh he won't do it again. What?! Maybe the HopeLine would be helpful to them. Great giveaway, and a great cause! I was a victim of domestic violence for 7 years, I love that Verizon is dedicating money to the cause. These headphones are awesome- color and style! I love that these headphones are wireless and the cause that is supported and I love the long battery life! Sweet headset. also love the cause that is supports. very cool. I like that they have Bluetooth connectivity and I would like to win them to use around the house. I like the Quad-layer speaker technology, I want to win so i can listen to my music while I mow the lawn. what I love most about these are that Verizon is supporting domestic home violence. my wireless headphones are not working properly would love to try these! I like the the-neck design. Having this would make doing tasks easy because of the hands free. Wireless and the color, it's my fave! Would love to use this everyday to watch my fave shows and listen to my fave music! Thanks for the chance! My husband has this same headset in blue. He was actually looking for it last night to watch a movie. love choices of colors. its a great giveaway supporting great cause. What an awesome looking headset! It would be perfect for my morning walks! What a great cause combined with a great giveaway. This headset would make a great holiday gift. First of all I love the color choices, the fact that it is compatible with my phone, and that the listening time is SO long! I love listening to my music for long periods of time without the batteries going dead. I would love to win because of right now I don't really have a good set of headphones that work great and these look as though I could walk easily without them falling down and I could take calls and pause in between walking and enjoying myself. Thank you for the giveaway & for the chance! 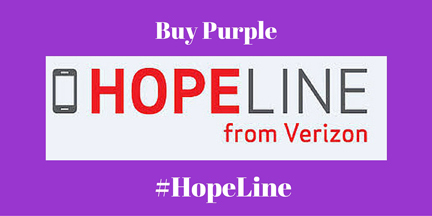 I love that Verizon made this special edition and purple design for HopeLine program. I would love to win and use it for walking and hiking! What a wonderful giveaway! I've always wanted to try that headset. I love that it's convenient, I can do several activities while on the phone hands free. I appreciate the form factorm and batery life is a definite plus. I would LOVE to win these for my son. I really like the long listening and talking times. i love that they are wireless and won't hurt my head. i also love the color! I love the design and the length of talk time, would love to win to use for getting work done! I like that they are bluetooth and that they are purple! no wires and I can use them to run! I have never heard of these wireless headsets before. I know they would be fun to own. I love that it's so compatible with systems from Android, Apple, etc. I also love that it's crystal clear sound and perfect for portability! My fave feature is that it's compatible with my device!! I'd love to win this, something special for me. Seems like the kids and husband always get stuff, lol. I love the music listening time up to 10.5 hours and talk time up to 16 hours, I can exercise, do work at home, in the garden and just about anywhere without having to stop what I'm doing. This is incredible technology! 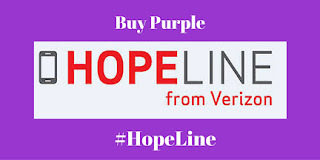 I love the support to a wonderful and important cause like HopeLine the beautiful purple design is awesome ! I would love to enjoy the speaker technology and the cool around the neck design is amazing! I could enjoy everywhere without no worries and be jamming in style! Thanks for the chance! The long battery life is a good thing. I want to win because I don't have any headphones. I give mine to my husband and kids everytime I get new ones. I like that they are wireless. I would like to win as this supports such a worthy cause and it is one which I truly believe in. What I like most about the LG Tone Pro Wireless Headset is that it looks very reliable. I want to win because I could use a new headset.